Guest: Marc Grossman, DO (New Paltz, NY). Dr. Marc Grossman is a New York optometrist who has integrated elements of natural Chinese Medicine into his practice, including the Magic Eyes program, with emphasis on treating the whole body or eye rather than just symptoms, to prevent and cure eye disease. He recommends the 2009 book, Healing Your Eyes with Chinese Medicine, by Andy Rosenfarb. Marc Grossman noted that the incidences of dry eye, near and farsightedness, cataracts, glaucoma and macular degeneration are increasing dramatically. He believes they are part of a whole body issue involving lifestyle, environmental factors and drinking sufficient water. Macular degeneration is a major cause of blindness. A central theme in Dr. Marc Grossman's practice is the Chinese practice of vision therapy. A series of exercises are employed to improve and maintain good eyesight and prevent dry eye. Since the eye is more connected to the brain (80% of learning is eye related), the brain can be a powerful influence. Dr. Grossman improved his own eyesight by 70% using the Magic Eye exercises. The exercises consist, in part, of working with a set of "Magic Eye Pictures," developed in China, that shift back and forth from near vision to far vision for about five minutes. To maintain eye health and spiritual balance and prevent diseases such as dry eye, it is important to follow the "Three B's" of "breathing," "blinking" and "beaming" (or smiling, which benefits the eye muscles). Sleep is also critical in eye health and dry eye prevention, as are eating dark green vegetables and drinking enough water each day (he recommends 64 ounces, taken four ounces at a time). 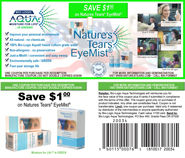 Dr. Grossman is an advocate of natural eye misting to alleviate dry eye symptoms. He notes that the all-natural water mist also picks up oxygen, which is extremely beneficial to the eyes. With dry eye, the tear film is always trying to pull natural water out of the air but when the air is too dry, this can work in reverse. Marc Grossman sees natural eye misting as a potentially indispensable accessory for dry eye, and the numerous dry eye related diseases, much like a toothbrush for teeth. Sharon's evaluation: I was excited to have Dr. Marc Grossman on the show because of his unique holistic approach to optometry and eye health, emphasizing lifestyle and all-natural therapies and his strong water advocacy. Eye disease, especially dry eye is a growing worldwide crisis and in which a new blindness occurs every five seconds. I fully support any approach that helps my listeners acquire the education to be proactive in promoting their own eye health.